Teaching the kids, Bentoy and Dondi, the famous Korean pose. This was in Bonsai Island, and the trees can you see the trees and the shore behind us? that's where we came from. 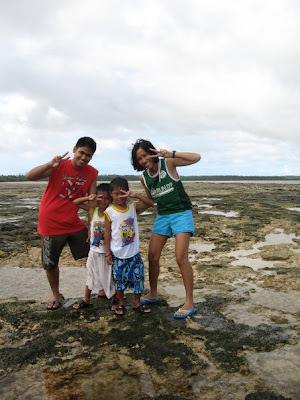 A mighty proof that it was super low tide when we went to Cagbalete Island last weekend. And the guy in red shirt is Phop! Photo by Charina Salvador.